One of the first things that you should be prepared for when you get a puppy is housetraining. The earlier you start and the more consistent you are, the smoother the entire process will be! If you’re adopting an adult dog, and you’re lucky, they will probably already be house-broken. If not, it can be harder to train an adult dog - but not impossible! Unfortunately, not all cases of dogs peeing in the house are that straightforward. A dog could also be peeing in the house due to an underlying health condition, so if you try several solutions with no results a vet visit might be in order. Keeping your eye out for other symptoms can also help you distinguish between a training problem or something more serious. Stopping a dog from peeing in the house takes patience, persistence, and sometimes a bit of problem solving. Making sure your dog is house-trained is important if you want a clean house and a happy, healthy dog. If your dog is house trained and you’re having problems suddenly, you may have to do a little troubleshooting to find out what’s wrong. There are many resources available for learning how to housetrain your dog, which can be extremely helpful if it’s your first time. Creating a small space where your dog rests and eats (think crate or fenced off part of the kitchen). They should be able to stand, sit, turn, and lay down comfortably but not have too much extra space. Use this as a safe space and not for punishment. Slowly expand your dog’s living space by taking him or her with you to other areas of the house, without letting them loose right away. Make sure your dog is always supervised and take them out often, so accidents don’t happen. Use positive reinforcement for good behavior and make sure not to leave your dog alone in a different part of the house. By following this simple strategy, your dog will eventually learn that the house is its living space, where it eats and sleeps. Dogs don’t like soiling their living space so eventually they will learn not to ‘go’ in the house. If your dog goes to the same one particular spot in the house, you may want to use No-Go! Housebreaking Aid Pet Organics. It's a spray you use to prevent/stop your dog from doing his business in places you don't want him to. Here's a great video with useful tips on how to stop your dog from peeing indoors while you're at work! Did you know that having your dog fixed can help stop a dog from peeing in the house and potentially make accidents happen? According to The Dog Bible: Everything Your Dog Wants You to Know, unneutered males usually pee around the house to mark their territory. It’s important to get them fixed for this reason and clean up any areas that have been marked if you want the behavior to stop. On the other hand, author Tracie Hotchner says that neutered females over six may leak urine and need to take medication for the rest of their lives to solve this problem. It’s important for owners to know these details and not blame their dog for things that they can’t control. Has there been a change in routine around the house lately? Stressful situations like a big move can cause housetraining regression in dogs who were great before. 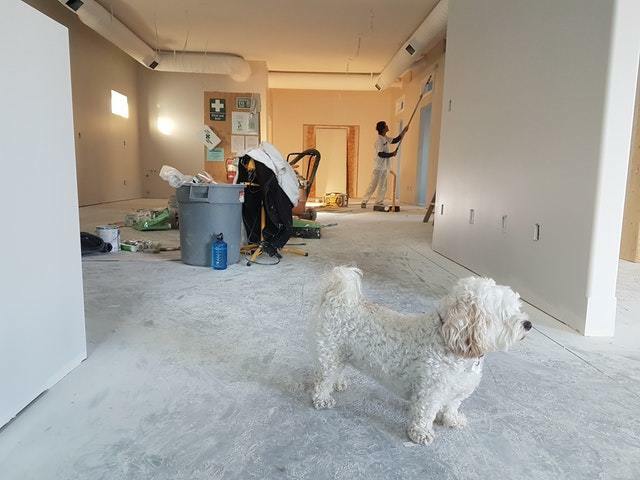 In this situation you must think of things like, “Did another dog mark its territory in this new place and my dog is picking up on that?” You may have to give the house a good clean and re-train your dog in this space. Depending on the type of stressor that caused the regression, in addition to a little re-training you may have to work on soothing the dog’s stress using one or more of these methods until things get back to normal. If you notice that your house-trained dog is peeing in the house suddenly and there haven’t been any substantial changes recently that might be stressing them out, you might want to take them to the vet. Going to the vet will help rule out disease or health problems. At the very least, keep an eye out for any other symptoms that might signal a deeper issue. If it’s not a health problem at least your mind will be put at ease and your vet might have some advice on what to do next. Dealing with a dog peeing in the house can be frustrating and gross, but in times like these your dog needs your attention and patience. Proper housetraining is key, but so is keeping yourself open to changes that might be going on in your dog’s life that might be triggering these problems. If you do this and the dog continues to pee inside the house, you should try to rule out potential health problems.